It’s no exaggeration to say that storytelling is as old as human civilisation itself. Perhaps, we’ll never be able to point to a time in the history of mankind and call it the dawn of storytelling. However, what we know is that the practice of storytelling began when man learnt to communicate. Be it through symbols, signs or words, man told stories to his peers. They were fairy tales, fables, legends, epics, myths, and stories of heroes, war and adventure. With time, stories became an integral part of his culture and society, passed down from generation to generation, each time narrated with a different spin according to changing scenarios. Through these stories, he imparted knowledge and narrated his experiences. While some stories inspired him, some others ignited the spark of imagination, transporting him to the world of wonder. Millennia later, it’s the same sense of wonder and imagination stories evoke. In a quest to understand this ancient tradition, Soulveda spoke to Geeta Ramanujam, storyteller and founder of Bangalore-based Kathalaya Trust and The International Academy of Storytelling. Presenting excerpts of a conversation, where she talks about the relevance of storytelling in the day and age of Instagram stories and her work in reviving storytelling in India. Stories play a crucial role in one’s formative years. Do you think an individual is shaped by the stories they grow up listening to? A storyteller creates his listener. In effect, the storyteller tells his listener, ‘In my story I determine you; for a moment—the duration of the story—your reason for being is the story itself; for the sake of the story, you are. In my story, I create a state of being in which you are immediately involved.’ The primary object of the story is the realisation of wonder and delight. In the presence of stories, we have an affirmation of the human spirit. It is a just and wondrous celebration. An individual is definitely shaped by what they constantly listen to from the time they are in their mother’s womb. The aural and oral traditions are a result of this. This had a great impact on my formative years as technology was still a far-fetched idea in the 60s and 70s. How do stories enhance the sense of imagination in children? Tell children a story and they listen with their whole being. Lead children to touch and understand a grasshopper, a rock, a flower, a ray of sunlight and you begin to establish a connection between children and their surroundings. Have them look at a tree—feel it, smell it, taste its sap, study its many parts, and how they work. This is the power of imagination. A child gets to see the entire story when an effective narrator or raconteur of tales transmits the textures of a story. What, in your opinion, is the role of language in storytelling? Each story is a natural teaching tool which becomes a springboard as you dive into the activities designed to provoke curiosity not only among children but also adults. This, in turn, facilitates the grasping of every syllable and tone of a story. Naturally, the impact it has on the audience is through spoken words. When we listen to a good story, words penetrate deep into the psyche which helps build a good vocabulary, learn sentence structure along with delivery and style. Stories cut through barriers of age, background, and culture. They help communicate with each other. How does the art of storytelling manage to achieve this? Stories are structured in such a way that they evoke and provoke a person to sit up and listen. The curiosity is triggered. And with the right sounds, gestures, pauses, and words, an experienced storyteller absorbs the complete attention of the audience, be it young or old, culturally different or with divergent backgrounds. That’s the secret of a story well told. What’s the relevance of storytelling in the age of technology? In today’s world, there’s no one speaking, telling or listening anymore as everyone is glued to their screens. Be it software professionals, children or senior citizens, we are all yearning to be heard and listened to. Storytelling fulfils these needs in a simple way called the human connect. In your personal capacity, how have you managed to revive the tradition of storytelling in India? There was storytelling in the pre-independence era, and then India gave way to nuclear families and people migrating from villages to cities in search of greener pastures. Being a teacher in the 1980s, I found stories an effective tool to transmit concepts to children. Later in 1996, when I did my first storytelling session, I realised that children were unaware of stories, folklore and lacked social skills and fine ethics of speaking and listening. It was at this juncture that I felt storytelling would be the ideal tool to bridge communication gaps. I began to feverishly find a modern application to this ancient art and storytelling found its feet all over again. You said you intend to bring about a positive change in society through storytelling. What is this change you talk about? The change we are looking at is to bring back family reunions, human connections, values and simple ethics of communication. Storytelling is positively the way to bring back the wheel of life and help individuals be. It would move people from constantly doing and being lost in the virtual world to the real world. We will cease to revolve around data, and stress on evolving into more holistic beings. Geeta Ramanujam is a master storyteller. 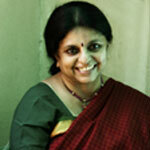 With an experience of over 37 years in the field of storytelling, she has trained globally over 85,000 people. She has revived the heritage of storytelling in India, by constant innovation in the space of storytelling. Recipient of several awards, including Ashoka Fellowship, International Storytellers Award and Bangalore Hero Award, Geeta continues to spin new yarns, fuelling the imagination of curious minds.